In this three-part series I hope to dive into the science behind setting goals and the impact goal setting can have on your organization. I hope to not only convince you of the dramatic impact goals can have, but to also give you several best practices around how to implement goals within your organization. Cecil Alec Mace (22 July 1894 – 7 June 1971) was a British philosopher and psychologist who was the first to perform empirical studies around goals and goal setting in 1938 . Mace was followed by American psychologist Professor Edwin A Locke (January 5, 1938 – ) who is considered the father of goal setting theory. His research focused on how goals drive motivation and are influenced by an individual’s cognitive functions and will. He also researched how goals impact task performance (drive results). Locke saw goals as “mediators” of actions. Goals which are specific produce better results, than goals which are general (i.e. a goal of “sell more stuff” vs. “sell $500K more contracts than we did last year”). According to Wikipedia ” A goal can become more specific through quantification or enumeration (it should be measurable), such as by demanding “…increase productivity by 50%,” or by defining certain tasks that must be completed.” The more specific the goal, the better results the goal will produce. The level of difficulty of the goal is directly proportional to performance. A goal which is harder to reach causes the person to work harder to reach it. There is a point at which a goal can become too hard and performance will drop off, so managers need to be aware of this and work with their direct reports on setting goals with the appropriate level of difficulty. Locke and Latham laid out five goal setting principles which can impact goal achievement. In order to sufficiently motivate someone to achieve a goal, that person needs to understand the “why” behind the goal. They need to have 100% clarity around why this goal is important and why the goal matters to the organization. With Envisionable, we help companies make that connection by walking them through a unique goal setting / strategic planning process which brings the most important goals to the top of everyone’s minds. Tying each goal to the long term strategy or BHAG is critical. For example, if your BHAG is to grow to a $100M company in five years, you need to have a clear goal on how much you will grow THIS year or you will never get there. Tying this goal to your company mission allows your team to see the WHY behind the growth. Locke and Latham discovered that each goal must be sufficiently challenging, but to a point. Notice the graph below. 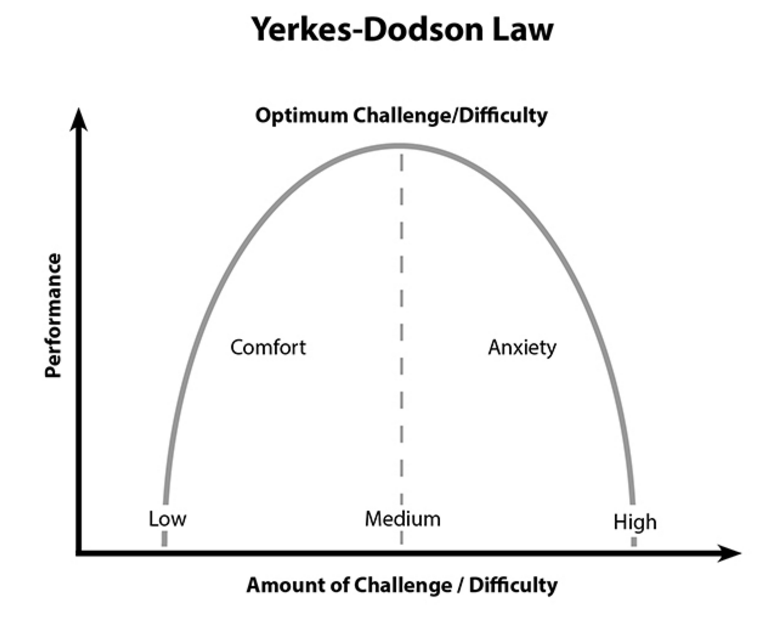 This represents the Yerkes-Dodson Law and helps to illustrate the concept. As the task (goal) difficulty increases, performance increases to meet the challenge, but only to a point. There is an inflection point where a goal becomes too difficult and the performance drops. An individual’s anxiety increases and they give up. Each manager must work with their direct reports to get this balance on target. It seems pretty obvious, but the more committed an employee or leadership team is to a set of goals, the greater the chance they will achieve those goals. How do you drive commitment? Helping everyone on the team understand the mission of the business. This has been proven to drive employee engagement and commitment. Managers should track performance of goals to allow employees to see how effective they have been in attaining their goals. This in turn drives greater performance. If you think about your current goal setting process, how frequently do you check-in with your employees on their goals and initiatives? Infrequent freedback does two things (1) sends the message that this goal must not be important – remember the goal importannce point above? (2) doesn’t give the employee feedback on how they are progressing and what they can do to improve. Both will have a negative impact on goal achievement. We suggest using a system like Envisionable to easily track employee goals and provide feedback. The last area where you can have a real impact on goal achievement is in task complexity. When speaking of task complexity, I want to focus on the time it takes to complete a task, rather that the difficulty of the task. There are tasks that can be complex, but not necessarily too difficult to accomplish. The key here is to make sure your expectations on the time it takes to complete each goal is reasonable. If you don’t, the goal may have the opposite effect you intend, an overwhelmed employee and failure to achieve the goal. I’ve made this mistake often. I’ve assumed that an employee should be able to complete a task and a certain amount of time without asking them first whether my expectations were reasonable. Need Help On Setting Company Goals? We can help you set the correct company goals and even help you put a system in place to track those goals on a monthly or weekly basis. Skinner, Natalie; Roche, Ann M.; O’Connor, John; Pollard, Yvette; Todd, Chelsea, eds. (2005). “Goal setting”. Workforce development TIPS (theory into practice strategies): a resource kit for the alcohol and other drugs field. Adelaide: Alcohol Education and Rehabilitation Foundation (AER); National Centre for Education and Training on Addiction (Australia). pp. 8–9. ISBN 1876897066. OCLC 156766716. Locke, Edwin A.; Latham, Gary P. (September 2002). “Building a practically useful theory of goal setting and task motivation: a 35-year odyssey” (PDF). American Psychologist. 57 (9): 705–717. doi:10.1037/0003-066X.57.9.705. PMID 12237980.